Saying he hopes to keep the matter out of the courts, San Jose Mayor Chuck Reed has requested a meeting with Major League Baseball Commissioner Bud Selig to discuss the Oakland A's pursuit of a San Jose ballpark. Reed said he has yet to have one single conversation with the commissioner. Reed said he wrote a letter Tuesday asking for the sit-down. He said he told Selig he hoped the meeting would help "resolve any lingering issues about our commitment to having the A's home plate be located in San Jose." The also said the meeting would help avoid additional litigation. 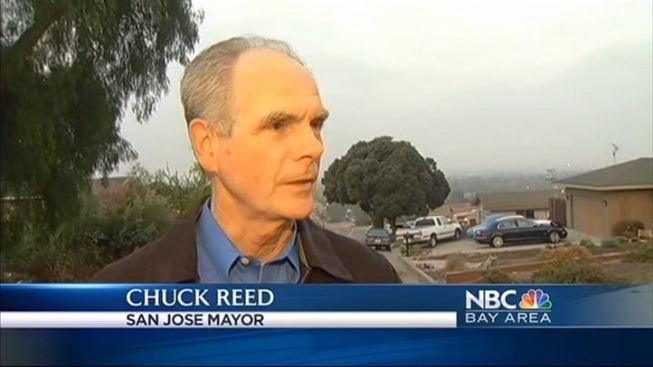 NBC Bay Area's Bob Redell asked the mayor if that was diplomatic speak for "please respond to us or the city is going to consider a lawsuit." "That's one way to interpret it. It's a straightforward question for a request for a meeting. There are some hard feelings that have built up over the years of inaction of Major League Baseball, but I think the best way to deal with it is to meet face to face - talk things out. He can hear our questions and answer them and he may have some questions himself. And maybe things could get better," Reed said. Selig assigned a special committee four years ago to study the proposed A's move to San Jose. The San Francisco Giants have objected on grounds they relied on territorial rights to the San Jose area when they built AT&T Park, now in its 13th season. "I'm hoping it might motivate the commissioner to take some action sometime soon,'' Reed said of his letter to Selig, which was copied to A's co-owner Lew Wolff. The A's have made no secret of their desire to leave Oakland for San Jose. They say a new ballpark in Silicon Valley could help the low-budget club become a big spender that wouldn't have to rely as much on revenue from other major league organizations. Major League Baseball spokesman Pat Courtney told the Mercury News the commissioner had not seen the mayor's letter and had no further comment. San Jose officials already have approved environmental studies on a proposed ballpark near the HP Pavilion and Diridon rail station. The City of Oakland, meanwhile, still believes it can build a new ballpark for the A's although Wolff has repeatedly said his franchise has exhausted its options in Oakland.